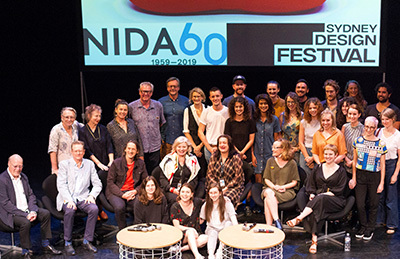 As part of its 60th birthday celebrations and in collaboration with the Sydney Design Festival, NIDA presented a one-day seminar on Design Excellence. The event attracted teachers, designers, directors and future leaders and included contributions from the wealth of experience of leading practitioners. 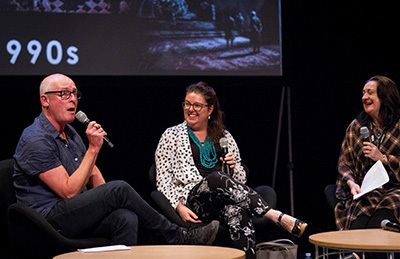 The seminar made connections across six decades in conversation, reflection and projection and ended with a panel made up of recent NIDA Design graduates. 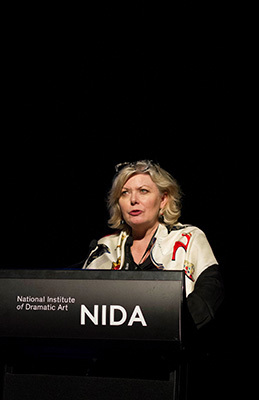 Dr Julie Lynch APDG, the sixth head of design at NIDA, and the first female, opened the seminar, and explained that since the design course began at NIDA in 1972, it developed from a Diploma to a Bachelor of Dramatic Arts in Set and Costume Design, to a Bachelor of Fine Arts and Master of Fine Arts Design for Performance, including Set, Costume and Lighting Design. Above: Dr Julie Lynch APDG, Director, Centre for Design Practices, NIDA and 1980s Panel Chair. Above: Stephen Curtis APDG, Senior Lecturer, NIDA and 1960s – 70s Panel Chair. Dr Lynch acknowledged NIDA’s previous Heads of Design - Arthur Dicks 1971 (Head of Production, then Design) to 1974, Allan Lees OAM 1975 to 1981, Robin Lovejoy OBE 1982 to 1985, Dr Peter Cooke AM 1986 to 2008, Michael Scott-Mitchell APDG 2008 to 2017. Above: Jim Sharman, Kim Carpenter AM, APDG and Eamon D’Arcy speak in the 1960s – 70s panel. 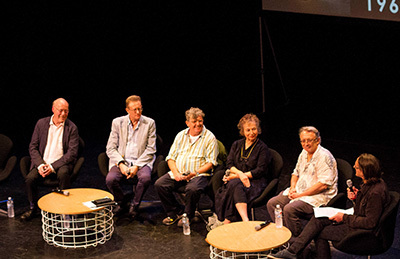 Above: Jim Sharman, Kim Carpenter AM, APDG and Eamon D’Arcy, Edie Kurzer , Bill Haycock and Stephen Curtis speak in the 1960s – 70s panel. 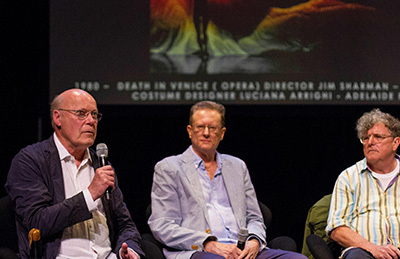 The panel sessions began in the 1960s-1970s, at a time when Australian theatre-makers and theatres were asserting their creative identity. NIDA was founded in 1959, and that decade saw the first Australia Council for the Arts, the opening of the Sydney Opera House, theatres such as the Nimrod committed to Australian work and the formation of the new Designers Association for the Performing Arts to represent Australian designers’ interests. 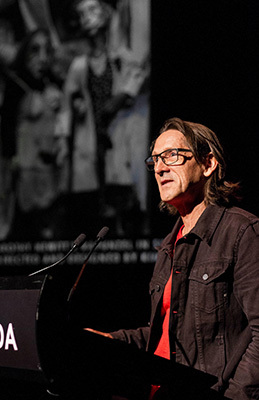 Stephen Curtis APDG chaired a discussion around this decade which saw a ‘new wave of Australian theatre-makers’ heralded by Jim Sharman’s production of Hair in 1969 and Kim Carpenter’s designs for Rick Billinghurst’s The Rake’s Progress in the same year. As the seminar moved through the decades, the panelists were engaged in vibrant and at times humorous debate on a wide variety of issues. Above: Peter England, Fiona Donovan APDG and Dr Suzanne Osmond speak in the 1990s panel. 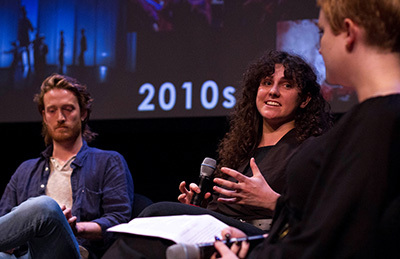 Above: Christopher Baldwin, Charlotte Mungomery and Sabina Myers speak in the 2010s panel. The panel on the 1980s reflected on how the role of designer has changed and the impact of technology. The discussions around the last decade of the 20th century were characterised by the integration of digital technologies into all aspects of life, and the broadening of design students’ horizons to include large scale international events and the global movie industry. At this time, the new facilities and theatre spaces at NIDA’s Kensington campus gave focus to the strengthening of the important networks and mentor relationships that existed within and around the NIDA community. The 2000s panel explored key themes influencing designers: the rapid development of digital technologies, climate change and sustainability, interdisciplinary practice (mobility across live performance and screen), and the evolving perceptions of the designer's role. The final panel on the 2010s discussed around design now and into the future, and focused on how current technologies and the socio-economic climate impacts on the work designers make. Other issues throughout the day included changing fee structures and agreements for designers, new markets and content providers such as Netflix and Stan in Australia, changing techniques and resources, the responsibility to design more ethically and sustainably, designing on paper or digitally, and the more recent “stage and screen ever cross-pollinating” as Sabina Myers said. Social responsibility and diversity in representation were also current issues that engaged the panel and the guest contributors.